Add a Logo – How can we help you? You can add your own logo to your account and individual programs. The logo that you upload to the Account Settings will be the default logo for all of your programs. When you upload a logo to an individual program, the individual program logo will override the default logo. Note: It’s always a good idea to size your logo image to fit nicely on your program. Be sure that the image is not so big that it takes up too much room, but not so small that it is illegible. To resize your logo, you can simply use MS Paint (found in your Accessories folder) and use the resize button. We recommend that your logo not exceed 320 x 100 pixels. 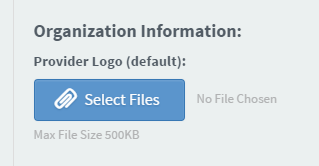 To upload your default logo, you will need to be a Provider Admin. Only the Provider Admins have access to “Account Settings”. Click on Settings in the blue menu bar and then click on "Account". Scroll to "Provider Logo". Click on the button to choose an image file. Once you've selected a file, you will see the name of the file appear. Click the "Update" button at the bottom of the page to save the default logo. If you visit your Account Settings page again, you'll see the logo there. Click on the program to which you want to add a logo. Click on "Edit Program" button. In the second section, "Program Details" click "Select Logo." Once you have added the logo file, you will see the name of the file appear. Click the "Save" button at the bottom of the page. Once the page refreshes, you will see the uploaded logo at the top of the page.